"A must read for anyone interested in understanding and developing assessments that can demonstrate the efficacy of their programs and services. A perfect sequel to 'Assessment in Student Affairs.'" - Charles C. Schroeder, vice chancellor for student affairs, University of Missouri Columbia"Upcraft and Schuh tell us when, where, how, and why we should conduct assessments differently within a wide variety of student service departments. Read and apply!" - Gary R. Hanson, professor, Educational Leadership and Policy Studies, Arizona State University. When "Assessment in Student Affairs" first appeared in 1996, readers found a practical context for viewing the power of assessment across the domain of student services. 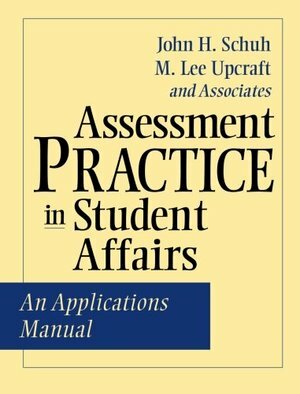 Since then, John H. Schuh and M. Lee Upcraft have received numerous requests for more specific guidance to assessing and communicating the value of student affairs. This manual continues the work begun in their earlier book and provides a full range of tools for conducting effective assessments. The authors begin with an overview of the assessment process and then detail a range of methodologies, approaches, and issues - explaining how to use them and when to recruit expertise from other campus sources. Drawing from the latest practice and a wealth of case studies, they discuss: qualitative assessment, including how to conduct focus groups; quantitative assessment, including how to select and design instruments; data collection and analysis, including mailed questionnaires, telephone surveys, and Web-based surveys; assessing diverse needs, satisfaction, outcomes, environments, cost effectiveness, and accreditation; specialized assessment studies, including how to review dropouts, graduates, academic success, and group educational programs; select programs in student services, including first-year programs, recreation programs, financial aid, admissions, residence halls, college unions, health services, career services, counseling services, judicial affairs, and Greek life; and organizational and ethical approaches to assessment.